The FIN approach integrates a variety of dry needling techniques during a treatment sessions. 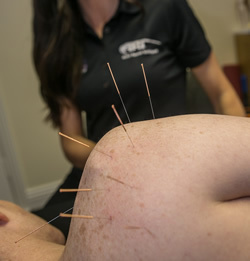 Unlike traditional acupuncture which typically uses points along meridians, dry needling targets anatomical structures including muscles, ligaments and joint capsules that are the underlying cause of muscle and joint related conditions. Common Conditions Treated with Dry Needling? During a typical FIN treatment, thin needles are inserted into various targets that have been determined to be the underlying cause of the painful condition. 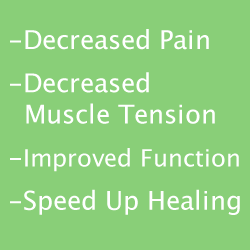 They are left in from several seconds to 20 minutes Different strategies are used for acute injuries and chronic pain conditions that make this a highly effective treatment modality for soft tissue injuries. The insertion of needles into the tissues causes the release of substances that help improve blood flow to areas of tightness and decreases sensitivity by dampening the pain signals in the nervous system and brain.